There is more to Tintagel than the legend of King Arthur and Tintagel Castle. On the main street of the village is the medieval Tintagel Old Post Office. This very well-preserved 14th century yeoman’s farmhouse on Tintagel’s Fore Street has a curious wavy roof and interesting exhibits on the inside. During Victorian times, this cottage was a post office for a brief period. It held a licence to be the letter-receiving station for the district and hence its name The Old Post Office. The National Trust bought this medieval cottage in 1903 and has restored it to its present beautiful condition. We arrived in Tintagel on Heritage Open Day and so we were treated to a free visit of the site. The cozy rooms inside the cottage display furniture, fixtures and other household items that give an idea of how things would have looked like in the early centuries. In the bedrooms are some interesting quilts that were made by local quilters. If quilting is your interest, the National Trust organizes quilting exhibitions here where you can learn about this craft’s history and pick up some tips. At the little ‘post office counter’ you can buy little souvenirs, stamps and Victorian postal memorabilia, but it is not a post office. Don’t forget to visit the cottage garden at the back of the building. This beautiful and quiet space offers a nice escape from the busy main street. In summer music and art in the garden are some of the events that take place here. If you’d like to know more about the Tintagel Old Post Office, the National Trust has a little booklet that covers everything, from its history, architecture, social history, natural environment and conservation to horticulture and garden history. The Old Post Office is open Mondays to Sundays from February to November. For more information about opening times and entry fee visit the National Trust website on www.nationaltrust.org.uk. 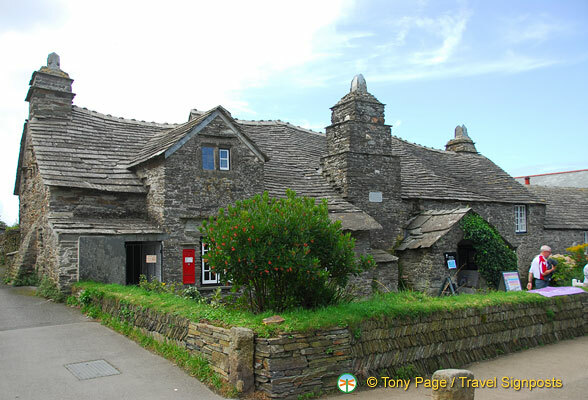 See more Tintagel Old Post Office pictures in Travelsignposts Tintagel photo gallery HERE.